Kun Aguero was the scourge of Tottenham Hotspur once again as Manchester City won 1-0 at White Hart Lane on the day they were dethroned as Premier League champions by Chelsea.Aguero scored all four goals in City's 4-1 home win over Tottenham in October and his first-half strike ensured he has now found the back of the net eight times in his last four games against the London club.Harry Kane and Ryan Mason went closest either side of half-time for Spurs, who have now won just two of their last seven Premier League games. Full Time Score : Tottenham 0-1 Manchester City. Tottenham Hotspur head coach Mauricio Pochettino: "I feel proud of our players. The performance was very good and we deserved much more. But the effort was brilliant. Manchester City manager Manuel Pellegrini: "I said before we were going to see a beautiful game because both teams play offensive football so I expect the fans enjoyed the game. 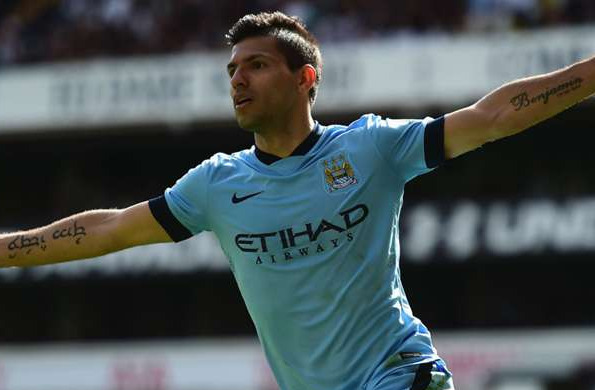 It was a close game and Sergio [Aguero] scored a great goal. I am happy about that. "You must remember against Tottenham that Chelsea conceded five goals, we have a clean sheet. Tottenham create chances with offensive players, but I think we have as many chances as Tottenham. We have to finish the season now and then we will analyse it. "I think it's important to finish as near the top as possible and see where we need to improve. Maybe Chelsea are more consistent this year and they won the league but we scored more when we did it."